Pipe Probe Penetration Robot (PPPR): Worldwide there are millions of kilometres of concrete sewers. Unfortunately, these sewers are susceptible to corrosion from biogenic hydrogen sulphide (H2S) gas, and, although they may pass a visual inspection, the structural integrity may be severely weakened. This industry project, funded by IWN Victoria, was to create a tele-operated robot with a novel concrete penetration testing sensor to give a measure of the depth a probe can penetrate and the force required for penetration. Hence, the level of degradation within a pipe can be estimated. AutoMange: Sarcoptic Mange is an infestation of Sarcoptes mites appearing in many different host species. For wombats living in the wild this form of mange is generally fatal and involves a slow debilitating death. 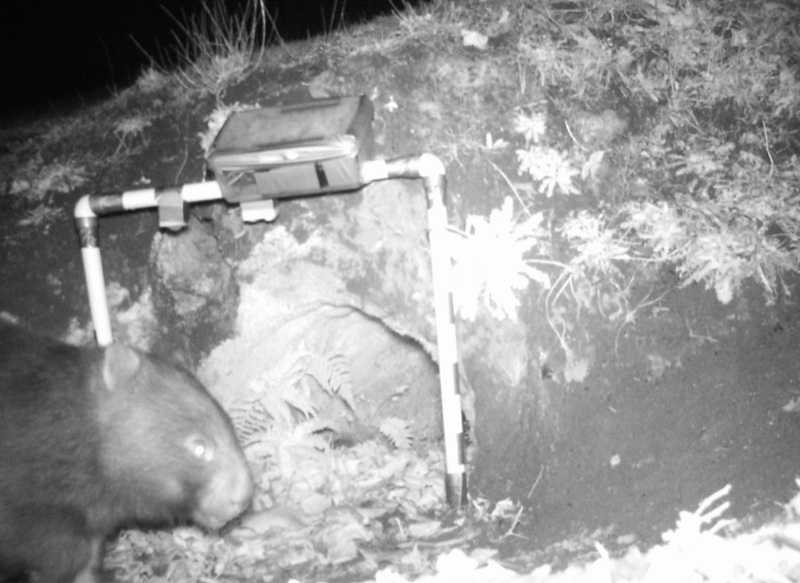 This industry project, sponsored by Griffith Components and an Innovation Connections Grant, includes a robot that can remotely monitor wombat burrows and treat wombats with Cydectin over a 16 week treatment period to halt the mite infection. RoboLizard: Qinghai toad-headed agama are dragon lizards from China. These lizards compete for burrows and communicate through a series of complex tail movements. To communicate with these lizards we built our own lizard which allows us to precisely control and manipulate the tail, hence facilitating research in motion signal structure. This research project was funded by the China Studies Centre and was done in collaboration with the Peters Lab. Concrete Manhole Inspection Probe: It isn’t just concrete sewers that suffer from degradation due to H2S. 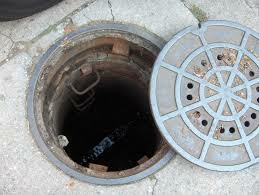 Manholes do as well and are predominately made from concrete. This project is ongoing and will result in a probe for testing the integrity of the walls of concrete manholes. R2D2: Some of our final year students have shown off their prowess in creating a full size version of the iconic R2D2. This creation even has some upgrades including text-to-speech, remote control with video feedback and hopefully soon drinks dispensing. 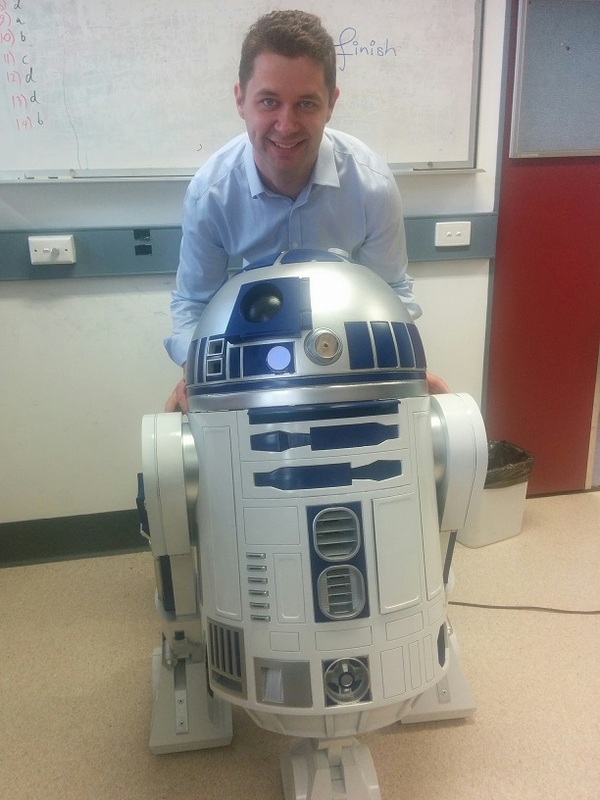 Lookout for R2 at a La Trobe Open Day near you. PyroShield: Fire curtains, as found in HVAC ducts, are drop-down thermally triggered fire-resistant barriers designed to block the spread of fire and smoke. Regulations stipulate regular mechanical drop-down testing as a visual inspection may not identify rust or jamming which may prevent a curtain from falling. But how do we test these – particularly when unlike in Hollywood we can’t safely fit inside them. 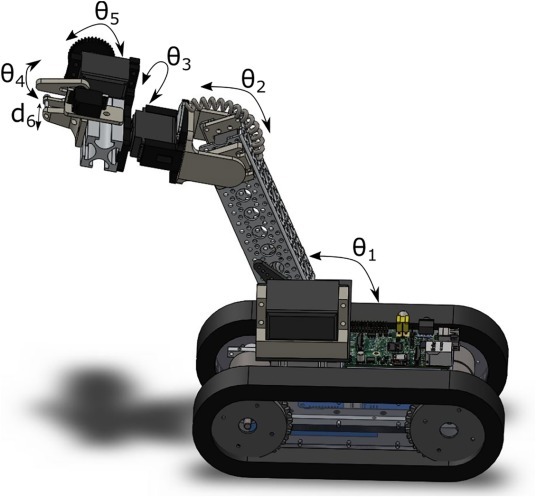 PyroShield is a pair of robots created for this purpose – one with a lifting arm and the other with 7DOF control to allow the thermal fuses to be manipulated to perform the testing. A.Beckett, R. Ross. "PyroShield - A HVAC fire curtain testing robot." Automation in Construction, 2017. Huynh, R. Ross, J. Devlin, B. Thai. "3D Anomaly Inspection System for Sewer Pipes Using Stereo Vision and Novel Image Processing." IEEE Conference on Industrial Electronics and Applications (ICIEA 2016), June 2016. Thai, B., Al-nasrawi, M., Deng, G., Ross, R. and Huynh, P., 2016, November. Constrained Smoothness Cost in Markov Random Field Based Stereo Matching. IEEE International Conference on Digital Image Computing: Techniques and Applications (DICTA) pp 1-5. 2016. Huynh, R. Ross, J. Devlin, B. Thai. "Adaptive Window Algorithm for Stereo Vision Using Successive Disparity Difference Feedback." IEEE Conference on Industrial Electronics and Applications (ICIEA 2016), June 2016. Thai, D. Deng, R. Ross, P. Huynh. "Weighted Bilateral Filtering for Near-edge Artifacts Avoidance and Impulse Noise Suppression." IEEE Conference on Industrial Electronics and Applications (ICIEA 2016), June 2016. Huynh, R. Ross, A. Martchenko, J. Devlin, B. Thai. "Anomaly Inspection in Sewer Pipes Using Stereo Vision." International Conference on Signal and Image Processing Applications (ICSIPA 2015), October 2015. Huynh, R. Ross, A. Martchenko, J. Devlin, B. Thai. "Dou-edge Evaluation Algorithm for Automatic Thin Crack Detection in Pipelines." International Conference on Signal and Image Processing Applications (ICSIPA 2015), October 2015. Huynh, R. Ross, J. Devlin, B. Thai. "Constrained Sliding Window Correspondence Algorithm for Fast Stereo Vision" IEEE Conference on Industrial Electronics and Applications (ICIEA 2015), June 2015. Ross, "Investigation into Soft-Start Techniques for Driving Servos." Mechatronics, vol.24, Iss.2, pp. 79-86, Mar 2014. Ross, J. Devlin, and A. de Souza-Daw. 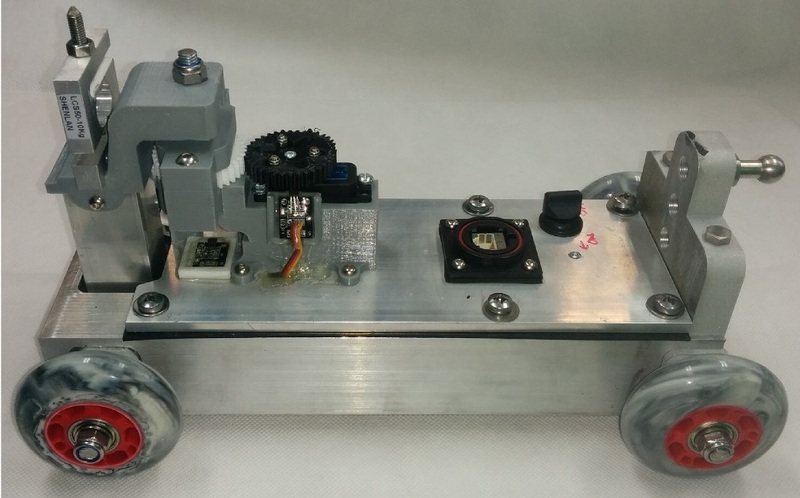 "VUIR: A Vehicle Undercarriage Inspection Robot." Recent Advances in Robotics and Automation, Studies in Computational Intelligence, Springer-Verlag, 2012. Ross, J. Devlin, and A. de Souza-Daw. "Mobile Robot Mosaic Imaging of Vehicle Undercarriages using Catadioptric Vision." In Proceedings of IEEE International Conference on Control, Automation and Information Sciences (ICCAIS2012). Ross, J. Devlin and S. Wang. "Toward Refocused Optical Mouse Sensors for Outdoor Optical Flow Odometry," Sensors Journal, IEEE , vol.12, no.6, pp.1925-1932, June 2012. Ross, J. Devlin, and A. de Souza-Daw. "Catadioptric Vehicle Undercarriage Imaging with Visual Path Planning." In Proceedings of IEEE International Conference on Automation, Robotics and Applications (ICARA2011). Ross and J. Devlin, "Vehicle Tyre Parameterisation using Binary Search Thresholding and Contour Fitting.” IEEE International Conference on Broadband Communications and Biomedical Applications, (IB2COM2011). Ross and J. Devlin. "Analysis of real-time velocity compensation for outdoor optical mouse sensor odometry." (ICARCV2010).